The concert on 22nd February 2015 enriched the audience`s spirit to fullest. It was organised by Liverbirds Moss, the local supporter club for Liverpool in Moss. On this day they contributed to Jamie Carragher's charity, the 23 Foundation. The two last songs "96 Lives" and "You`ll Never Walk Alone" really touched the audience hearts and they were brought to new heights. Photo. Al McHardy and Christan Slawinski - Live in Moss, Norway. Slawinski sung is own song "96 Lives" and it all ended the with chorus on "You`ll Never Walk Alone". The supporters rose up and sung the best they could. © Travel Explorations. 96 remembered in the beautiful song "96 Lives"
Christan Slawinski, also called Stan Slawinski ("Stan is his artist name"), is a singer-songwriter from Aughton, Lancashire, and the lead singer in the London-based trio, The Branco Heist. He was only seven at the time of the tragedy when he wrote the song as a tribute to the 96 who lost their lives on 15th April 1989 at Hillsbrough. Lyrics in Slawiniski`s own songs are often based on personal experiences from his life in Liverpool. He supports Liverpool Football Club and is also a well known artist among the today`s Liverpool players, the legends and supporters in Liverpool. The duo Christan Slawinski and Al McHardy toured around intensively in southern Norway during the weekend, from the capital Oslo, to Sarpsborg, Fredrikstad and to the last venue Øre Villa Kro in the town of Moss. Here they played three sets, both own songs and covers from Rolling Stones, the Jam, the Kinks, Pink Floyd, Mersey Beat-songs from The Beatles, The La`s and Gerry and the Pacemakers. 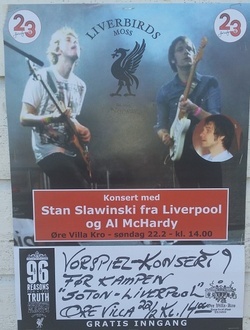 Poster advertisement for the concert by Christan Slawinisk and Al McHardy at the pub Øre Villa Kro in Moss, Norway. Around 50 supporters attended the concert. 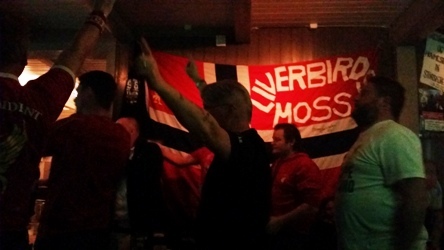 It was organised by the local support club Liverbirds Moss, Håvard Skifterud and Lars Smith. © Travel Explorations. Their show was a dialogue driven with the small talk, jokes and funny strong personal stories. It was a fantastic interaction between the musicans and audience that I have never experienced before. Already from the start it was established a strong link between them. 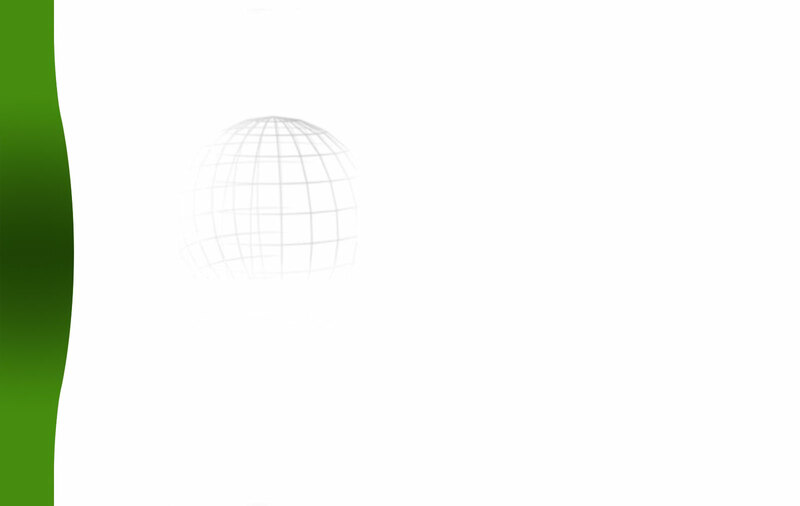 And it was of course all related to Liverpool, football, music, city, people and life there. The stripped-down acoustic set proved Christan Slawinski's vocal strength and charismatic stage presence. Slawinski and McHardy sparkled and shone inside the pub just as the beautiful sun outside. Enchanted by the show the supporters mood rose. 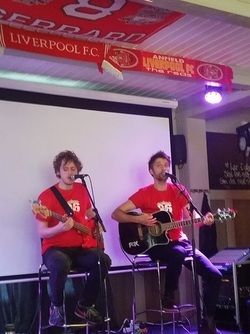 As the final rang out before the today`s big Liverpool match, Slawinski and McHardy performed the songs "96 Lives and "You`ll Never Walk Alone" and the crowd erupted into sing along, cheers and wild applause. They replied with a big emotional "thankyou" and left the stage. Watch the video from the concert at the pub Øre Villa Kro in the town of Moss, Norway: Christan Slawinski and Al McHardy performing the song "96 Lives. Watch the audience rise up from their chairs during the song. It`s was a strong emotional moment that really turned them on! I say that’s entertainment, that’s entertainment! (the last line in the song "That`s Entertainment" by the Jam as Slawinski and McHardy performed too). Yes, l will say too: that was really good entertainment! After the emotional tribute to the victims of the Hillsborough disaster, the Liverpool supporters could watch Liverpool beat Southampton 2-0 and climbed up to the top again. Ufortunately Christan Slawinski and Al McHardy didn`t have time to watch the match. They had to hurry to the Moss Rygge Airport to reach the flight back to Liverpool, but the Liverpool supporters in Øre Villa Kro continued the big party. I encourage everybody to support this song and the fantastic work Christian Slawinski, Al McHardy and all the Liverpool supporter clubs do for rising money to Jamie Carragher's charity, the 23 Foundation. Remember the spirit in the song You`ll Never Walk Alone! Christian Slawinski`s Facebook page 96 Lives. You can follow Christan on twitter @Stan_Branco. Stan released a single called ‘96 Lives‘ to coincide with the 25th anniversary of the Hillsborough disaster, when 96 people went to a football match and never came home. Before Christmas the track featured on a compilation called ‘Justice for Hillsborough’ which went to number 1 in the Scandinavian charts, and now together with Ora Studio and Jamie Carragher’s 23 Foundation, the song is being officially released. For every download a contribution will be made to the foundation, which supports community projects in Liverpool, a wonderful city that we as a band owe much to. With the song being dedicated to the victims and families of the tragedy, we hope the release can in its own way highlight the fight for Justice for the 96. Hillsborough CD tops Scandinavian album chart - Justice For Hillsborough sold tens of thousands of copies in Norway, 28th August 2013. Hillsborough campaigners have applauded the creators of a CD which reached the top of the Scandinavian album charts. The compilation of 14 songs – called Justice For Hillsborough – was heralded as a “lovely gesture” after it sold tens of thousands of copies in Norway. The Hillsborough Family Support Group and Hillsborough Justice Campaign will both share the proceeds from sales of the CD. The song "96 Lives" is available on iTunes and Spotify, via liverpoolhearts.com. It`s also available on the streaming service Wimp. For every download of 96 Lives a contribution will be made to the Hillsborough Justice Campaign and Hillsborough Family Support Group, and also to Jamie Carragher's charity, the 23 Foundation.